Although DNA and other nucleic acids are critical in genetics, they are also important in moment to moment life processes. 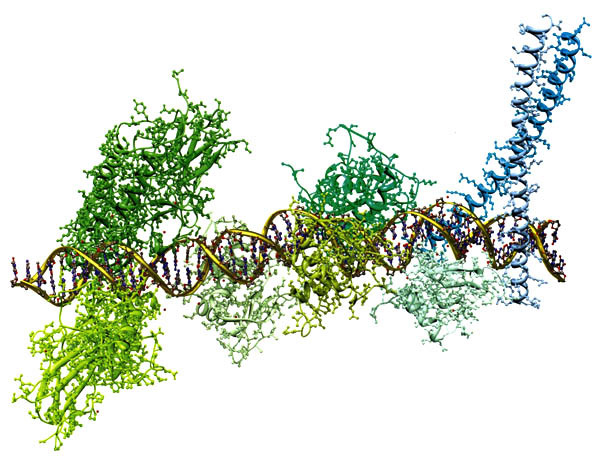 In order for the information in DNA to be implemented, proteins are essential. Here can be seen a short section of DNA surrounded by a complex protein Enhanceosome that triggers an immune response to viruses. If uncoiled and placed end to end, the DNA in an animal would stretch to the sun and back 70 times. Proteomics is the study of the prodigious protein that is associated with this DNA and with other biochemical and structural functions, and highlights the importance of protein in the diet.